At the Microsoft BUILD 2016 conference this year, Microsoft released the public preview of the Microsoft Bot Framework. 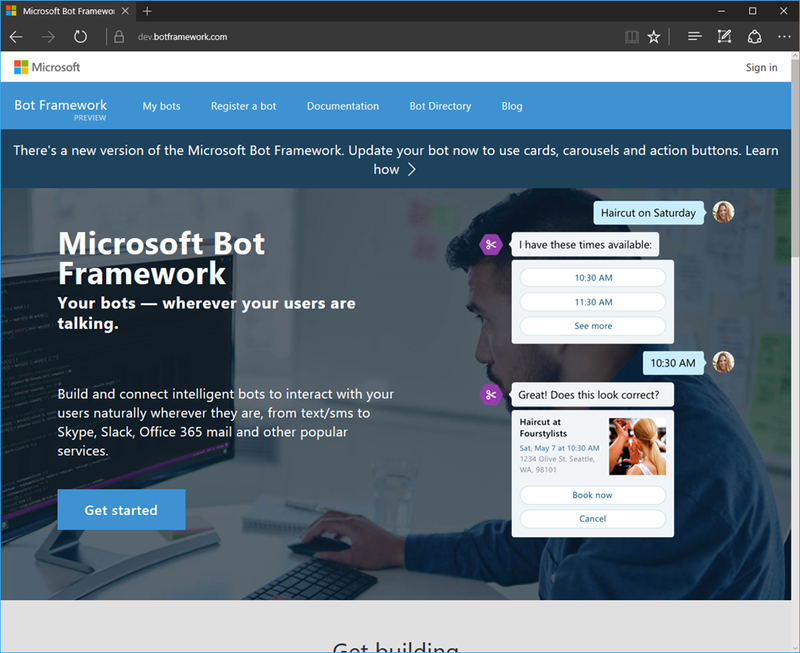 The Microsoft Bot Framework provides just what you need to build and connect intelligent bots that interact naturally wherever your users are talking, from text/SMS to Skype, Slack, Facebook Messenger, Kik, Web Chat, Office 365 email and many other popular services which are constantly being added. The Bot Framework enables organizations to build Bots, also known as intelligent conversation agents. It lets users interact with intelligent solutions as though they were conversing with a real person and interactions can take place in many forms, from text/SMS to Office 365 email, to Skype and Slack. Bots are quickly becoming an integral part of the digital experience for users to interact with a service or application. The Bot Framework provides automatic translation to more than 30 languages, user and state management, tools for debugging, an embeddable chat control and the means for a user to discover, try and add bots to their conversation experience of choice. 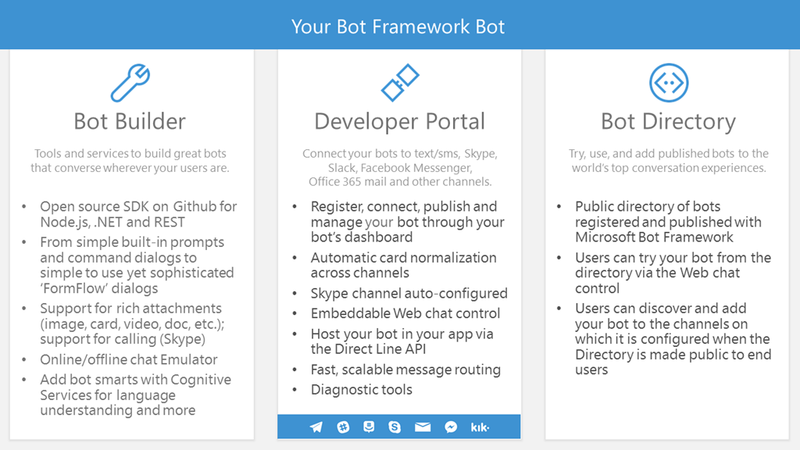 The Bot Framework consists of three main components, the Bot Builder SDK, Developer Portal and the Bot Directory. The Bot Builder SDK is available on GitHub and is a set of code libraries in C# and Node.js to help with building the bot. It also provides integration with LUIS which is the Language Understanding Intelligent Service, which gives support for natural language interaction. The Bot Directory is a public directory of all available registered bots. From the Bot Directory you can browser, try and add bots to your favorite conversation experience. You can also see a listing of available bots from Skype. 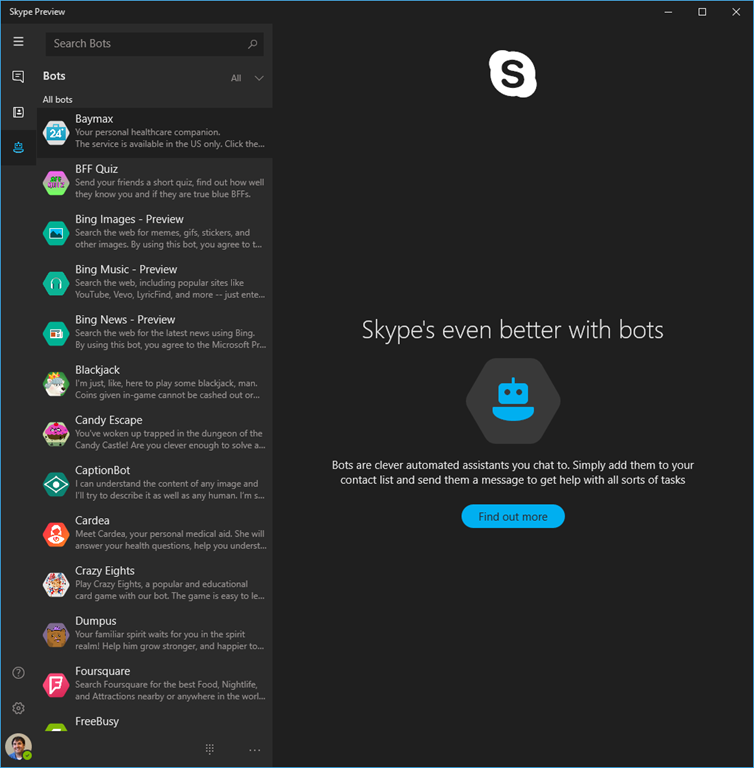 Here is the Skype Preview app and if you click on the bots section, you can see 38 bots (at time of posting). You can checkout the Bot Directory for a full listing of registered bots. In a future article I will explore creating a bot and deploying it to Azure. Get started with the Bot Connector. Get started with the Bot Builder – C#. Get started with the Bot Builder – Node.js. The mistake that kills too many start ups – Talk to your customers! Great Post: Talk to Your Users. Or Else! I completely agree with what they have to say. This is why we use UserVoice for our ReflectInsight .NET Logging tool over at ReflectSoftware for capturing feedback and support from our customers. I have not tried the other tools mentioned, but I highly recommend that you evaluate them and use one, even if it’s for something simple. I came across an interesting rumor about the possible retirement of Windows Live Messenger and having Skype take over. If that is true, then Windows Live Messenger might be no more in a few months time. I use both Windows Live Messenger and Skype, so it would be nice to have them consolidated into 1 account, 1 service. I’ve also tried Skype on Windows 8 and it’s fantastic. If you haven’t tried Skype, then you should.